Philip Blumel: Don’t mess with Texas, not Arlington anyway. Hi, I’m Philip Blumel. 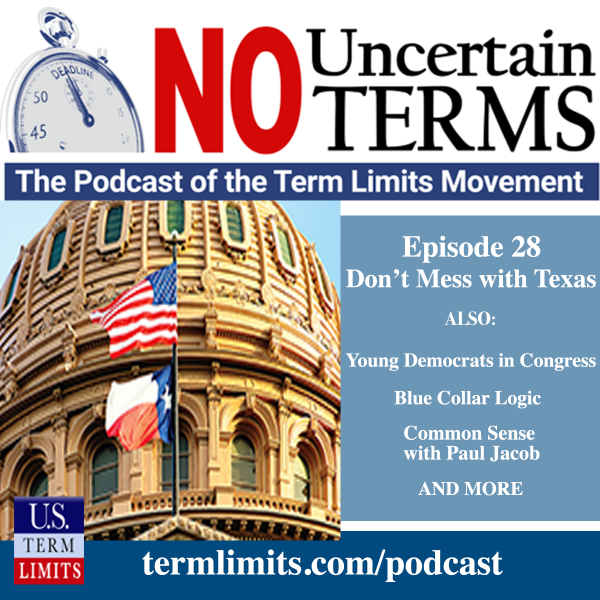 Welcome to No Uncertain Terms, the official podcast of the termless movement for the week of February 18, 2019. Stacey Selleck: For sanctuary from partisan politics. Philip Blumel: Street fighting Manzak Maxwell and the other citizens got the last work in Arlington last week. But in Washington, D.C., it looks like the youthful rebels and the house democratic caucus were squashed by the long established leadership. With US Term Limits director Nick Tomboulides and others promoting the Term Limits Convention Bill in Utah, I’m in charge of the news roundup this week solo. Let’s get started. First on the list is a very gratifying victory down in Arlington, Texas. Philip Blumel: We’ve been this following this story since the beginning with Zack Maxwell and a bunch of other activists who got together, collected signatures, put a six year retroactive measure on the ballot that applied to the city council of Arlington. It won. Even after it won, the council tried to sue to keep it from going into effect. Crazy story at every stop. The city council tried to block Zack and his crew. They tried to stop them from collecting signatures. They tried to stop it from getting certified for the ballot. They tried to come up with an alternative measure to cause confusion at the ballot box, which got thrown off by a judge. Philip Blumel: Then after the election being held and the citizens won clearly and decisively, the city sues to try to get it nullified because they basically argued that voters didn’t know what they’re doing. Well, just last week a state district judge tossed out the lawsuit aimed at stopping these tournaments in Arlington and did so very clearly, very quickly and very decisively. Philip Blumel: Hey, Zack. I’ve been reading the news reports and I know we’ve been following that story on this podcast for about a year now. I finally see that a state district judge tossed out the lawsuit aimed at stopping your term limits effort in Arlington. That must feel great. Zack Maxwell: It feels amazing. It’s good to be a winner. Philip Blumel: Is it finally over? Zack Maxwell: It’s never over. It’s never over when you’re dealing with the Arlington city council, but I think that the brunt of the legal stuff related to the election, the election has come and passed. With the announcement the other day related to that lawsuit being tossed out of the court, being a frivolous lawsuit it rightfully deserved to be tossed out of court. That pretty much seals the deal on the election. The election is set in stone, it’s done. So at this point, they could appeal. Theoretically I’ve been told that obviously that could happen. They could make an appeal, we just don’t feel like they have a case anyways so that would be a dumb move on their part. But obviously the bigger thing that we’re looking out for now is the establishment of this sort of quasi citizen committee that’s really just appointed by our city council. And of course they want to establish a committee to try to water down the term limits that were passed and basically change them to the way that they want them. Philip Blumel: Oh sure, this is an old tactic. The citizens committee. And so they’ll appoint their own people, they will take an objective view of the charter and look for improvements and one of those improvements will just happen to be undoing the popular term limits measure that just passed. Zack Maxwell: Yes. And they’re absolutely going to do that. They’ve already been collecting the applications for it. I pulled all those applications and it was very apparent the vast majority of them are good ole boys, donors, people that fundamentally actually told the city council they did not approve for term limits and here they are applying to be on a committee to ultimately come up with the rules for term limits. So that is what we’re looking out for at this point. We’re also just trying to make sure that we, hopefully, can put some rational thinking individuals into these seats that are now opening up, people that will honor and respect the outcome of that election and fight [inaudible 00:05:01] to change it. Philip Blumel: Well I’ll tell you what, this idea of setting up this commission now that they’ve lost the election strikes me as sort of anti-climactic. It feels desperate and I know that this was sort of a meaty event in your city because they tried to stop you and because it went to court twice and because of the money spent by the city of Arlington trying to defeat your measure. People know about this. It’s gonna be really hard for them to convince people that there’s anything genuine about this committee and anything that it comes up would ultimately have to come back to voters before it changed the laws. Is that correct? Philip Blumel: Yeah. So I don’t know. I’m going to revel in your victory this week. It’s great to see you won. We’ll check back with you and see what these clowns on the Arlington commission come up with next but I just wanted to call you and congratulate you. Zack Maxwell: I appreciate that and I hope that this fight over here has maybe inspired people in other cities to take up the torch because it’s entirely possible for citizens to walk away with the upper hand. Stacey Selleck: Mark your calendars, February 27 is National Term Limits Day. On February 27 each year everyone is encouraged to make a show of public support for term limits. Here are some ideas for February 27 Term Limits Day activism. Post a term limits sign in your yard. You can make one of your own or purchase one from our store at termlimits.com/shop. You can also organize a sign wave at a busy intersection. Grab a couple of friends and make some homemade signs that say, “Honk if you love term limits.” And enjoy the public support you’ll hear from passers by. Go to termlimits.com/legislatures and use our easy peasy online tool to contact both your federal senators and your US house rep. Wish them a happy term limits day. Stacey Selleck: And finally, you can take a selfie holding a happy term limits day sign and post it on your social media. Whatever you decide to do, send pictures to termlimitsday@termlimits.com and it will be shared with hundreds of thousands of fellow term limit supporters just like you. You can make history by saying you were a February 27th Term Limits Day founder. Philip Blumel: There was a disappointing but not altogether unexpected development in the story we’ve been following about the house freshman that led a little rebellion in the democratic caucus in the US house in which they were going to withhold their votes for Nancy Pelosi as house speaker unless there was some kind of term limit put on the leadership, at least, and maybe even committee chairs for the house democratic caucus. Because many of these freshman, as you recall, they had pledged during the election that if they were elected they would not vote for Nancy Pelosi as the house speaker. Well, in January a deal was brokered, as often is in politics, and Nancy Pelosi made an informal tournament on herself. She said she’d only serve for four years more in this position and also that there would be a vote on whether or not there would be formal term limits set on the leadership offices, including the house majority leader, the house majority whip and the house speaker itself. Philip Blumel: Well, Ed Perlmutter, who was the leader of this little rebellion, he’s a democrat from Colorado, he announced in a house democratic caucus meeting last Wednesday that there will be no vote on these term limits by February 15, which was the informal deadline in this deal. Democratic caucus chairman Hakeem Jeffries of New York then told lawmakers that an internal caucus panel would have to study the issue and it’d report back to the rank and file democrats later. This was widely taken as saying that this issue is never going to come up for a vote. So that’s very disappointing. The speaker did get the votes she needed and became the speaker once again and the freshman class of democratic legislators who wanted to have some chance of having some measure of influence and power without waiting a decade and crawling through the special interest gauntlet for all that time, they lost. They got sucker punched. And hopefully they’ll remember that and hopefully they’ll recognize that’s one of the reasons why term limits and rotation in office, particularly in most leadership, is so valuable. Philip Blumel: Jason Siler and Dave Morrison are two working stiffs with something to say. They have a YouTube channel and associated Facebook page they call Blue Collar Logic. Last week they opined on our favorite subject. Speaker 5: Holding public office shouldn’t be a lucrative career. Serving the people should actually come from a place of wanting to serve people. But as long as getting elected comes with all the perks of being a CEO at a Fortune 500 company, many people who seek to hold office will only do so for their own benefit. Look at the wealth, prestige and power these politicians get by working for the people. It’s obscene. Rewarding politicians like this turns their focus away from governing over to staying in power and gaining more power and making more money. And why wouldn’t it? After all, these are just people with all the same flaws that the rest of us have. Could you imagine having a job where you could just vote yourself a raise? It would be hard not to, wouldn’t it? Did you know that a senator gets over $3 million a year to pay for any type of official expenses they incur? Including their travel, office personnel they hire and office supplies. $3 million. That’s how they can afford to fly first class and eat five star dining on a regular basis. Speaker 5: What he’s saying is that holding office should be very hard work and not financially advantageous. Which is the complete opposite of what it actually is today. Senators only work 162 days out of the year. They have a budget that allows them to rub elbows with the high society types and they get paid better than 90% of the people slugging it out in the private sector. Not only does it look like it’s time for term limits, it looks like it’s time to reduce their pay and benefits. Speaker 5: James Madison was actually against term limits because he thought that frequent elections would be enough to stop corruption and abuse. Well, he was wrong and Jefferson was right. Politicians are not burdened by the office they hold. They’re not suffering any financial loss and they definitely aren’t working that hard. They don’t even read most of the bills that they vote on. In the private sector, they’d get fired for being so work shy. Even though our founding fathers didn’t agree on term limits, they did agree on what it meant to be a civil servant. It’s supposed to be a burden, a setback to your private life. It’s supposed to be something that you felt compelled to take on for the love of country and your fellow Americans. As Jefferson said, “By throwing the rascals out from time to time, they will remind government that it exists to serve us, not the other way around.” And that’s the simple truth. Philip Blumel: On the congressional term limits front, our proposals continue to advance. We’ve been following the addition of co-sponsors to the two federal amendment bills and we’re up to 10 co-sponsors in the US senate. And now up to 33 co-sponsors in the house. Our latest addition to the co-sponsor list is Denver Riggleman of Virginia. But of course we don’t expect the federal bills to pass without enormous pressure and we expect a lot of that pressure to come from the states. And hence, three states have already called for an article five amendment writing convention, limited to the subject of congressional term limits and many more are considering it this year. Philip Blumel: In Arizona we saw a significant move of the term limits convention bill this last week. House concurrent resolution 2022 passed the state house federal relations committee last week by a vote of seven to zero with all three democrats voting with the four republicans on the committee. The resolution and it’s sister resolution in the senate have attracted nearly 30 co-sponsors which include a number of democrats in both the house and the senate. So this is a truly bipartisan bill. The full state house vote is anticipated next week. Philip Blumel: Our executive director of US Term Limits, Nick Tomboulides, as I mentioned is in Utah with other term limits activists working very hard on pushing a term limits bill through that legislature and here’s Nick with an update. Nick Tomboulides: Thanks, Phil. I am here embedded in Salt Lake City on a mission to bring term limits to congress. It is freezing here and mysterious white flakes are falling from the sky. As a Floridian, I’m not familiar with these and I’m going to have to investigate further. The Salt Lake Valley is surrounded by the majestic Wassach Mountains, much like the capital in Washington DC is surrounded by the mountains of debt, deficits and dysfunction. US Term Limits western director Bob Barry and I have been here meeting with state legislators for two days to discuss passing the term limits convention. We have made strides. It looks like the bill now has a sponsor in the state house and state senate. We’re expecting it to be filed shortly. Nick Tomboulides: Utah has a bumpy history with term limits. In 1994, a political maverick here named Merryl Cook threatened to collect signatures and slap eight year limits on the state legislature. Fearing that, the legislature reacted by passing 12 year term limits on itself but repealed the law in 2003 before those limits could take effect. That was 16 years ago, which is a century in politics. These politicians now look at Washington and acknowledge the average folks have lost their voice. 88% of Utahans want term limits for congress. That is the highest polling number anywhere in America unless you asked our podcast audience. The term limits convention has previously passed the Utah house twice but never the state senate. That will be the challenge. The new senate leadership team, president Stewart Adams and majority leader Evan Vickers has us optimistic. Both have shown support for a convention in the past. Nick Tomboulides: Success here is going to come down to the people of Utah. Do they want this badly enough? If they contact their state legislators and ask for a term limit convention, it will get done. If not, we will fail. After all, this is a grassroots powered movement. It’s not lobbyists and insiders who are gonna make this happen. It’s you and me. From Salt Lake City, this is Nick Tomboulides for US Term Limits. Philip Blumel: Paul Jacob is a board member of US Term Limits and president of the Liberty Initiative Fund. Paul Jacob: One of the great myths in official Washington writes poster and pundant Scott Rasmussen at ballotpedia.org is that voters hate congress but love their own representative. Working for term limits, boy have I heard this assertion a lot. Voters do hate congress, this we know. Less than one in eight Americans approve of the job being done or not by congress, according to a brand new, the economist ugov poll. The remaining question, however, is whether we really like our own congress person. The correct answer appears to be not so much. A recent ScottRasmussen.com national survey, conducted February 1st and 2nd of this year found that less than one in four voters, only 23% actually think their own representative is the best person for the job. A far larger percentage, 38%, believe others in the district are more qualified. It is certainly possible, of course, that folks could think there is someone better than their sitting congressman and nonetheless, still love their rep. Though, doesn’t love seem like way too strong a word? Paul Jacob: The notion that we are consumed with amorous urges toward our own federal representative is evidenced only by the high re-election rate for incumbent congressmen. But those rates are more likely the result of the powerful advantages of incumbency, not gleeful adoration of our career politicians. Paul Jacob: There is one way to test our level of devotion, let us vote on term limits and see what happens. It would lead to a new question, where did our love go? This is common sense. I’m Paul Jacob. Paul Jacob: For more common sense with Paul Jacob, go to thisiscommonsense.com. Stacey Selleck: This week’s letter to the editor comes from Rhonda Crow of Virginia Beach from the Virginian Pilot. Subject: term limits needed. January 20, 2019. The shutdown is a perfect example of why congress needs term limits. Neither leader has called for all the boys and girls to sit and settle things. People’s financial livelihoods are at stake. I shutter to ask how two people can cause the entire electorate to shut down. That comes from too much time in Washington DC. There is a reason for term limits and they are needed in more than just the executive branch. Rhonda Crow, Virginia Beach. Stacey Selleck: Thank you very much, Ms. Crow, for taking the time to write your newspaper about the importance of term limits. If you’d like to express your opinion on why term limits are necessary, email your local newspaper’s editor. Who knows, if we spot your letter to the editor online, it may be read on the next episode of the No Uncertain Terms podcast. Stacey Selleck: I don’t think she meant electorate. Philip Blumel: The victory in Arlington is more proof that this issue is a winner when citizens press it. We need to keep pressing on at all levels of government. And if we do, we’ll keep reporting on this podcast new and greater victories. Thanks for listening to us but please subscribe if you’ve not already done so. On your iPhone, use the podcast app. On your Android device, you can use Google Play, Stitcher or just go straight to iTunes and while you’re there subscribing, also please rate and review us. We’ll be back next week.